Updated the PDF with instructions of the use of the blocks specially those who post to timeline. Use of the fields, examples and results of posts and also links to Facebook of those calls to understand the use of the fields. Also information about the new API 2.9 depreciations. Above that, also reference of where this blocks are used inside our leaderboard game. So easy to understand how to configure. 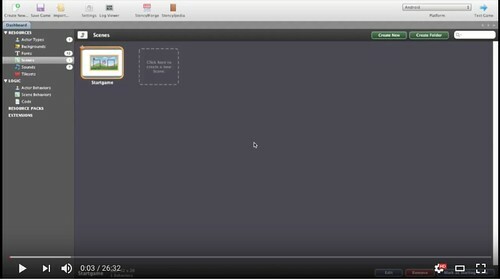 The link for download is sent to all users of Ojyaleaderboard extension. Thank You for update but it is still very hard and unclear. Your sample game is not allowing to learn, because all values there is empty, and there is so many things that not needed. For now, you are using so many custom blocks that referencing to many different places and all actors referencing to the scene attributes, and it is not easy at all to understand all connections and meaning of all blocks. And, if I need to post screenshot, do I need to make opengraph object on the facebook site? If yes, it is even more insane without coding knowledges and learning of it will take a lot of time probably. Probably easiest way is to make everything as in your game but change images but as I said I don't need all this things, just screenshot. And I need it in 2 days as long as I spent on this extension a weeks already, without any results so I can't spend more time. I inserted all behaviors from sample games. But nothing happens, when I use it, no facebook login, no post actions. New PDF instructions of use of the extension with examples. Available to all users of the extension in the same link emailed to you. You are missing maybe a path or a wrong name creating the two scenes or the game attributes. Check it gain. To import the game in your game please follow EXACTLY the passage explained in the site. If you miss one path won't work or will give you error. 1. Use the exact names of those 'game attributes' you must create first in your game. 2. Create first the two scenes with the exact name as described. Case sensitive. Those in my game. Use also the same width and height, if possible. 3. Import all the assets, actors, sounds, etc ... by drag and drop. 4. Assign to the two scenes the scene behaviours as described. 5. Control if when imported the actors the actor behaviours were imported automatically. Check inside each actor if has it's behaviour assigned. 1. The sample game, if compiles without error then check if the AndroidManifest.xml is setup ok with your Facebook APPID inside. You are using only Android for the moment as you told me. So don't bother about iOS. 2. Have you created your Facebook test app with the settings for Native mobile inside the Facebook Developer site? 4. If compiles ok and those 3 attributes are correct and your Facebook developer site is ok then will execute the login in your Android device and all the rest in the game. I can't plac all your files, you are using giant images and sound on more than 15 mb, it is too much. So I modifing your behaviors and exclude some buttons, that I really don't need. The thing I need to know before proceeding if the sample game works as it should. So , please , create some test users , login , post scores , and post to time line. Also share some bonus between your test users. In that way we exclude errors, that maybe the settings in AndroidManifest or the same Facebook test app may have. At the end , if you arrived till this point, let's exclude errors. One other thing , your app in Facebook must be assigned as game. Ojya leaderboard uses game requests action. So just control that. After, if everything works ok, proceed of sliming down some sounds and images. But, in my opinion if you need login only and post a screenshot you can set it easily. In your game. Using only the extension. In the PDF there is how to make a complete login. Download it now. JUST copy the use of the blocks as is described. After the login , it is always common to make the call /me , so you can see the name and the photo of the user logged in. After that you can start using the block for posting to timeline. An image generated in your game or a screenshot. Some info for you and the other developers watching this forum. A leaderboard like Ojya game is developed in 6 months, at least, using only the extension. First must operate in every possible situation with no errors , specially the scores. Saving in local device the score must be done always, and in certain situations . Offline gaming is a big effort in programming. Dealing with facebook errors etc. Installing for the first time the app , generating first time scores in the Facebook server etc is another resource in programming. Has other variables to consider. All this after someone has deep knowledge of how Facebook works and how the calls works. Then you can start using Ojya leaderboard extension and creating your game from the scratch. 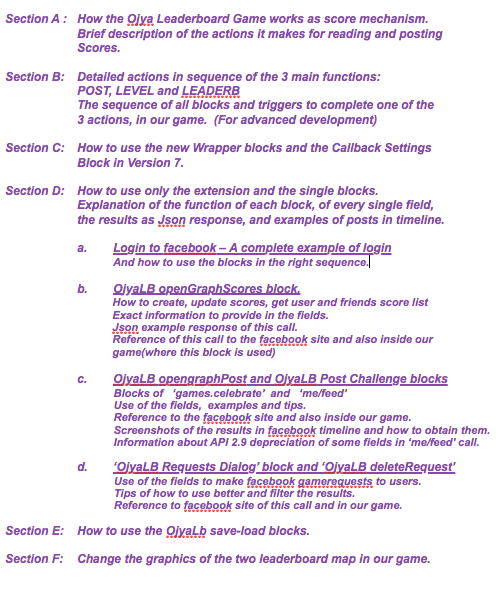 So , if you want to use all the functions and also scores., you can use Only the extension to make calls and get the callbacks , but you must design the whole structure of your game behavior with Facebook. Leaderboard design takes the same amount of time as developing a complete game. Point. So keep in mind this. I logged in my test game, but when trying tio post image, the game is crashing, what I'm doing wrong? use before this also the OjyaLB CallbackSettings block. as in photo. attached down. First let's see if you have done the login ok.
1. Go to the Facebook site of the test user and see if the application is installed and with what permissions. You must have' friends_list' and 'publish_actions' (POST). If you see you app icon , click on the pencil icon. Those are the settings of the app installed. 2. Even if you don't use the image attribute 'challengebackImg' when selecting 'screenshot' create it the same. 3. Use a valid link and make a test again. Please read also inside the PDF the instructions about API2.9 depreciations of this block. The link from now on is used for an external site link to take the image from the site and also other information reading the meta-tags of the site. It cannot be used with a user generated image inside the app. If you want to use the large image you can use it, but you have to provide a link inside the message. Which is clickable. See example inside the new PDF of today. Same dropbox link i sent to all users 3 days ago. PS: As i mentioned before , use the sample game leaderboard and check all the functions. Also Challenge the users. Post to timeline. with this block you use. The game should function well if Facebook user is logged in.
" You must have' friends_list' and 'publish_actions' (POST)." I generated test users, but not sure about 'publish_actions' (POST, how to do it, and how to check? I am out for 3 days. Return on wednsday. Ps: I never saw in your stencyl blocks to draw back results. Why ? It is a common use to do that. You have to check the response of the callbacks inside you game and then you know what answer has the callback. If success or no and everything else. IMPORTANT UPDATE. All users update Now. - Site refer now only to version 7e and API 2.9. Cleaner , simple and immediate. - Now install and setup is even much simpler. - Extensive PDF information with examples. 1. Fixed issue of reference of behavior ‘ojyaleaderboard’ left inside the code of the extension version 7a. Could not permit some actions to complete. 3. New behaviors for ‘OjyaLB postOpenGraph’ and ‘OjyaLB PostChallenge’ blocks. Now you can directly insert in the field the real image attribute block to post. to follow all the paths. 5. With API 2.9 , very easy to install and start rightway testing the game. 6. Slimed code in Android and also in iOS. 9. Testing made for importing only the single extension and the game for version 7e. Simple Login and post to timeline. So, finally I published the game using this extension. And passed facebook review process. That is not easy. I sent them game 2 times, they just answer (after 5 days) that they "can't test your game, check it" nothing more. So I was need to writee to support and prov that my app is working.